Landscaping in Ontario combines several considerations: a complexity of hardiness zones, proximity to water (the Great Lakes in the south and east, Hudson's Bay in the north) and the windy, changeable weather typical of large bodies of water, relatively low elevations and flat, settled areas. A May/September warm growing season limits some plant choices, but you can choose from an array of native and acclimated shrubs, depending on your hardiness zone. Narrow bands formed by plant hardiness zones follow the border and Great Lakes coastlines in Ontario; in the Ottowa area there are, for example 5 zones. Toronto, on the water, displays growing zones as warm as 5, and Windsor, actually south of Detroit, has a zone 6 growing area. Ottowa, roughly 250 miles north of Toronto, however, combines summer zone 4 with winters described as "severe," with snow on the ground for up to 120 days. Cold is a constant factor to consider in Ontario landscaping, and garden calendars often provide instructions for securing shrubs against sudden or sustained cold. The large areas of southern Ontario close to large bodies of water mean that weather can be regarded as changeable. Rain is frequent, summer weather tends to be humid and wind is a factor in landscape design. Shrubs such as junipers provide windbreaks year-round; hydrangeas and the variety of woodland berry bushes (serviceberry, gooseberry, highbush cranberry and blueberry) will diffuse winds except in deepest winter. 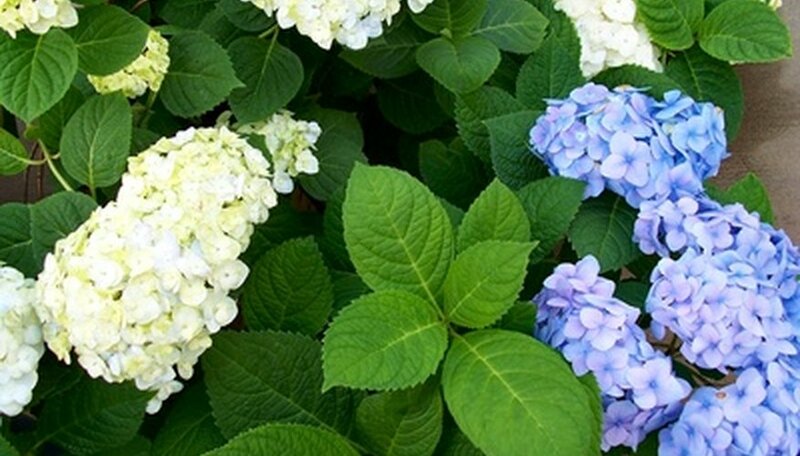 Hydrangeas make for a useful nonnative shrub, contributing to foundation plantings that deter cold drafts. Flat or nearly flat terrain is predictable for many Ontario yards. Slopes tend to be shallow, and few landscapers show the sorts of multiterraced patios and stairs that conquer the hills in other areas. Low retaing walls and patios work well on flat land; walls can be used effectively to shelter outdoor areas from nearly constant breezy and windy activity. Taking advantage of small trees as well as shrubs can produce visual variety in a level yard. From redbud to hawthorne and several kinds of dogwood, Ontario boasts a range of blooming trees; equally varied fruit trees come in dwarf and small sizes as well. Create additional visual interest in a near-level yard by building raised flower beds or berms. A bed can follow the path to the front door, edge one side of a patio or capture the sunspot for rosebushes. Raised beds can be any height from 4 inches to 2 feet. A berm can be stone-edged or trenched, rising above the lawn by 6 inches to 1 foot, and containing a small blooming tree or large shrub, like red ozier dogwood or a variety of smaller blooming or evergreen shrubs. Yews and junipers in particular come in a wide spectrum of shapes, from spiky to oval, mounded, feathery or formal, and colors from golden yellow to blue-green. Varying the heights, shapes, colors and textures of shrubs adds strong visual interest to the flattest yard in Ontario. In addition to native shrubs for the Ontario area, consider adding color by incorporating spirea, burning bush, hydrangea and dwarf lilac into shrubbery landscaping. You can find colorful suitable for any hardiness zone; dogwoods, berry bushes, and cotoneasters add nonnative interest. Coupling shrubs with ground covers further increases their visual impact. For best results, consult with a nursery that is knowledgeable about your particular climate. What Are the Zone 6 Plants & Flowers?